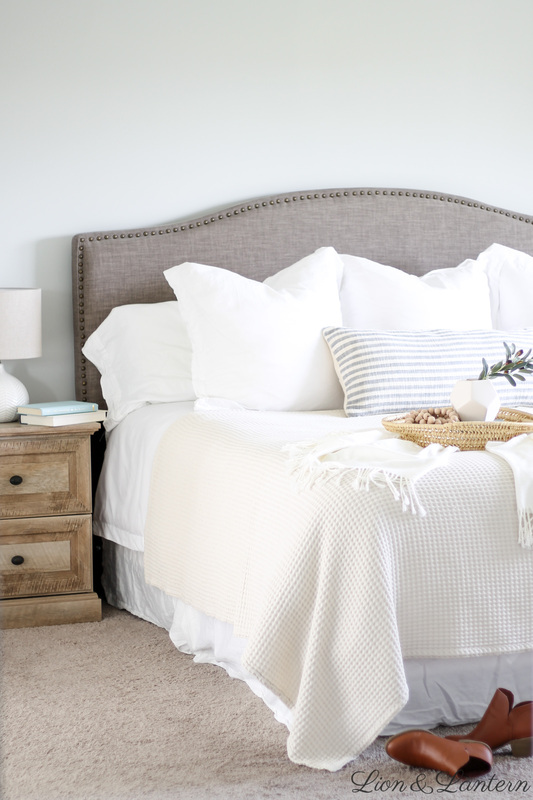 White bedding, driftwood tones and varying textures make this modern coastal bedroom feel airy and fresh. 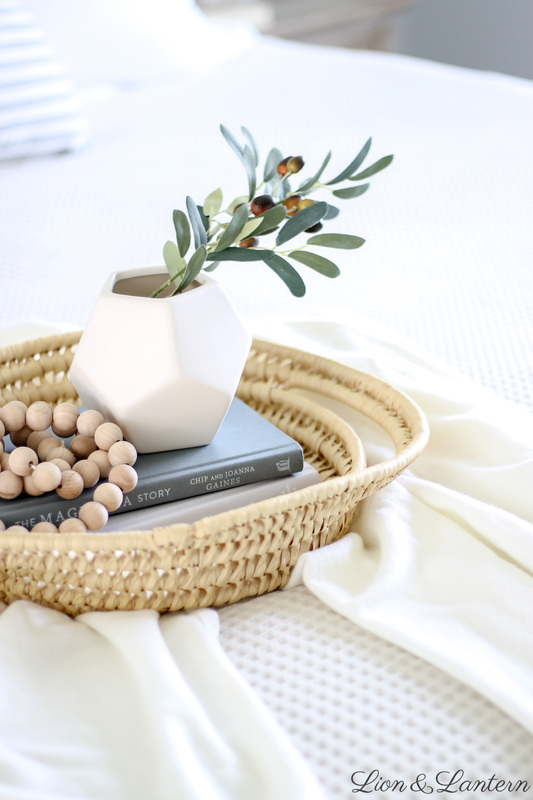 Thrifted baskets and books keep this update budget friendly! A while ago I shared a design board for this space. Since then, I’ve already changed my mind about a few things–of course! 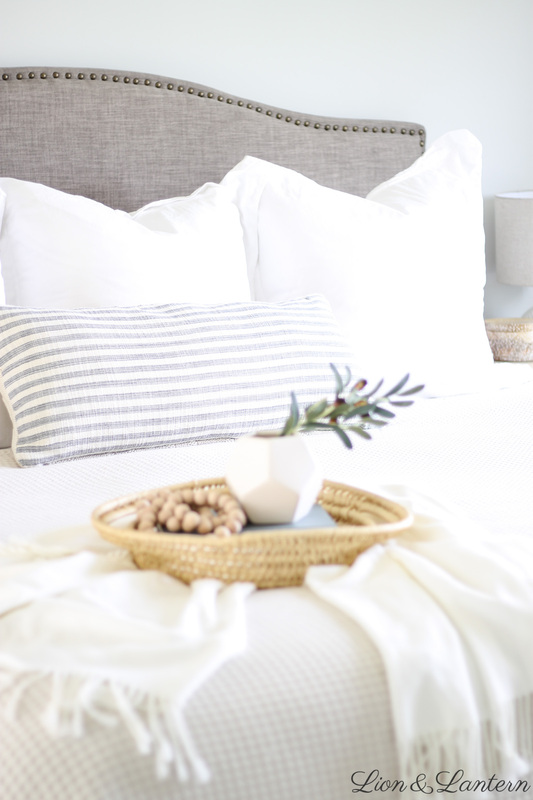 😉 However, I stuck with my original plan of three euro pillows with simple white pillowcases, and a striped lumbar pillow as an accent. 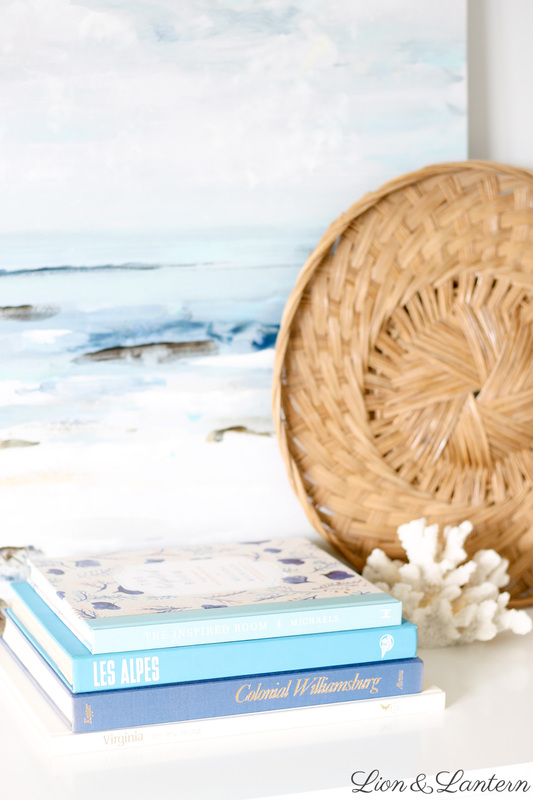 Stripes add a coastal, casual vibe and go with just about anything. 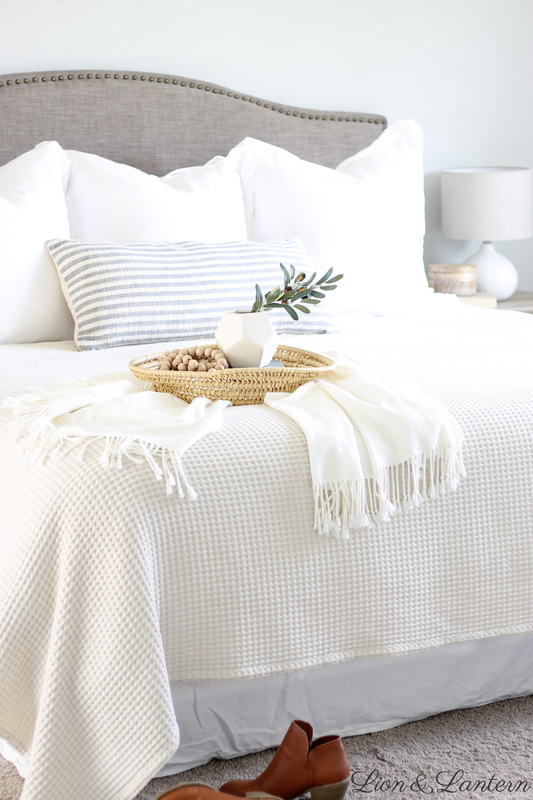 As for the rest of our bedding, I would like to do an update at some point since ours is not very luxurious–just an inexpensive white duvet cover and too-small waffle weave blanket (I pulled it to one side to make it look bigger!). One step at a time! 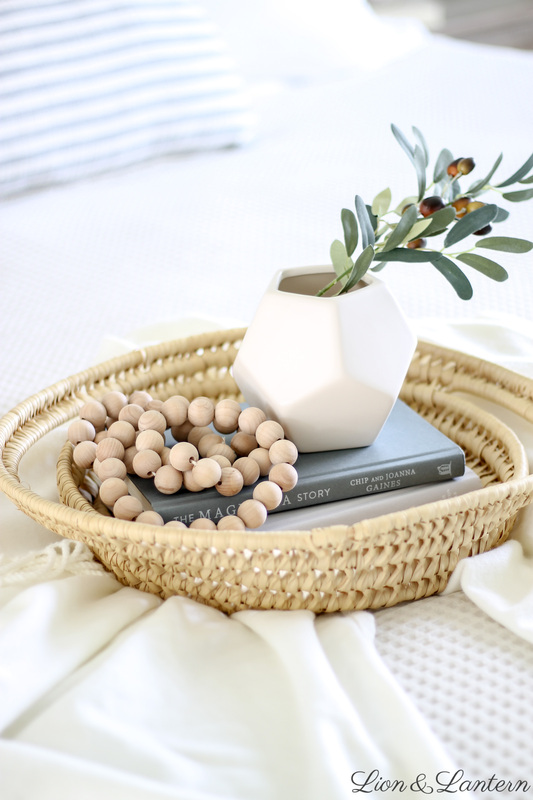 Last week Ladybug and I made a quick trip to Goodwill while Bug was at preschool, and I found this gorgeous woven basket. The color and texture are exactly what I was looking for, and the price was downright amazing–$2.50! 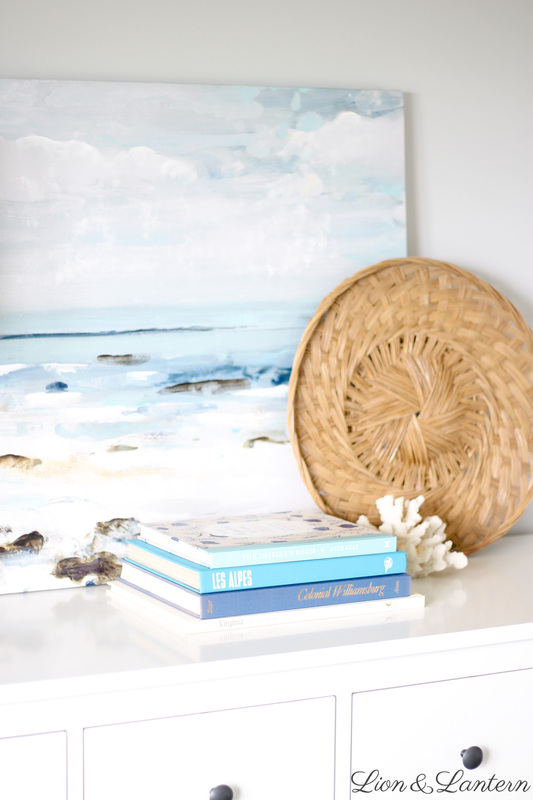 I love the seagrass look for a modern coastal space. 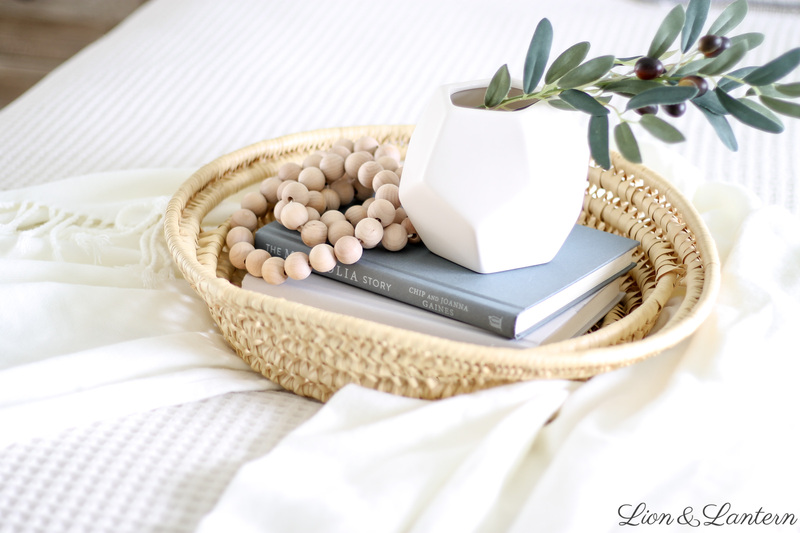 Since snapping these photos, I hung the basket on the wall above the bed, and am loving it there as well. More photos soon! 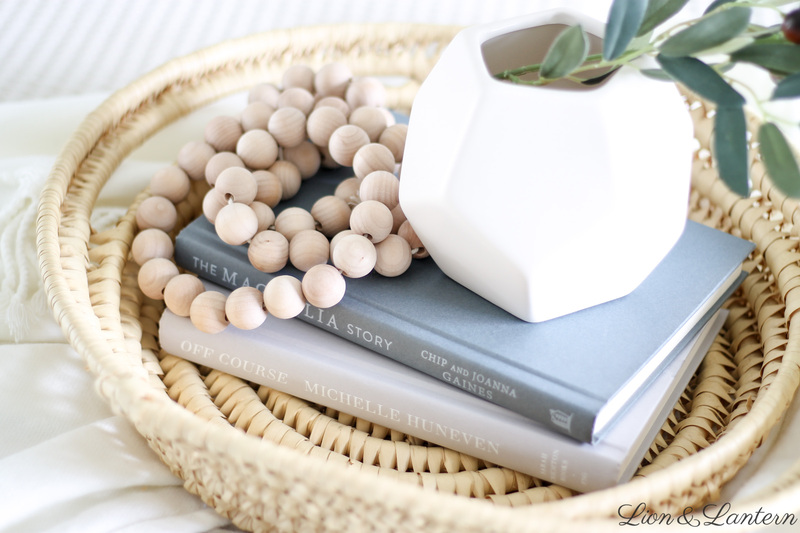 If you like the wood bead garland, I have an easy tutorial here! 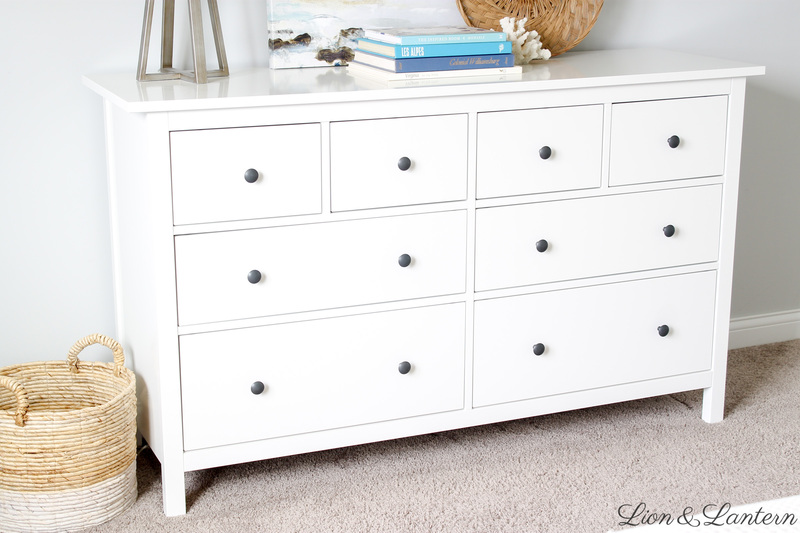 We recently purchased our white IKEA Hemnes dresser. 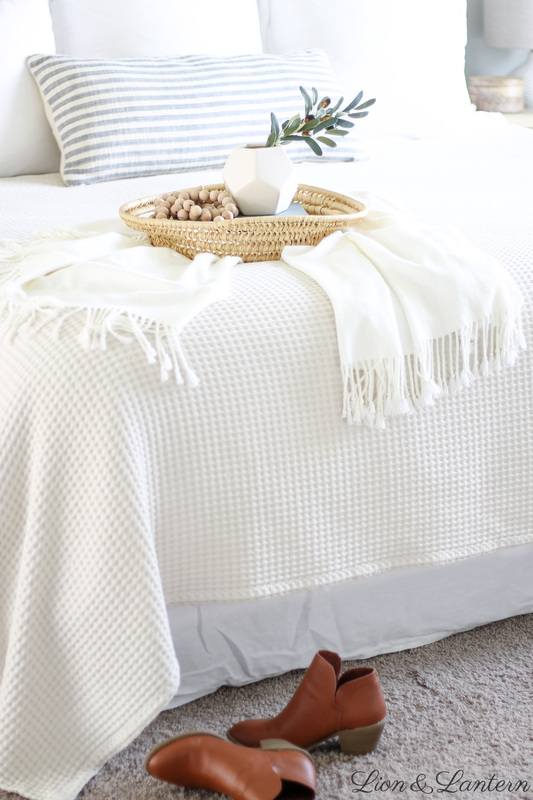 I love the simple, modern look, the ample storage space, and of course, the price tag 😉 We selected white (versus white stain) because it has a glossy finish that I feel will hold up better over time. 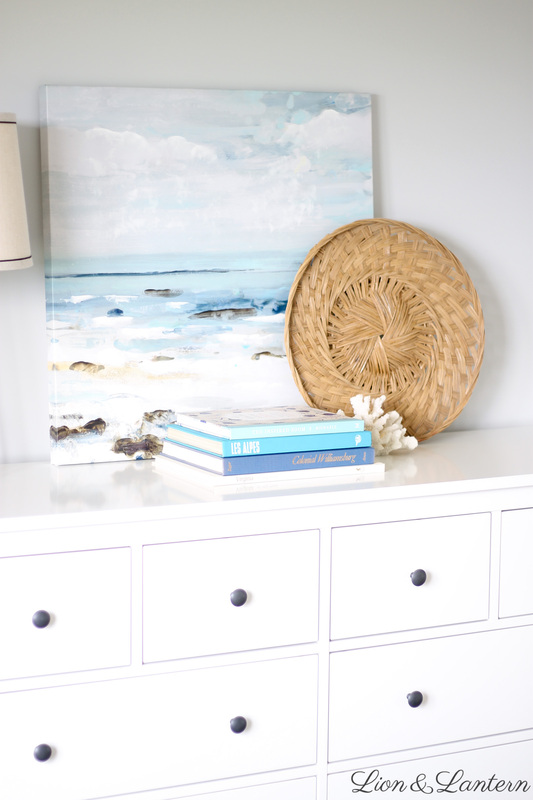 The dresser is the only big item we have purchased for this space so far, and I’m so pleased with the decision. 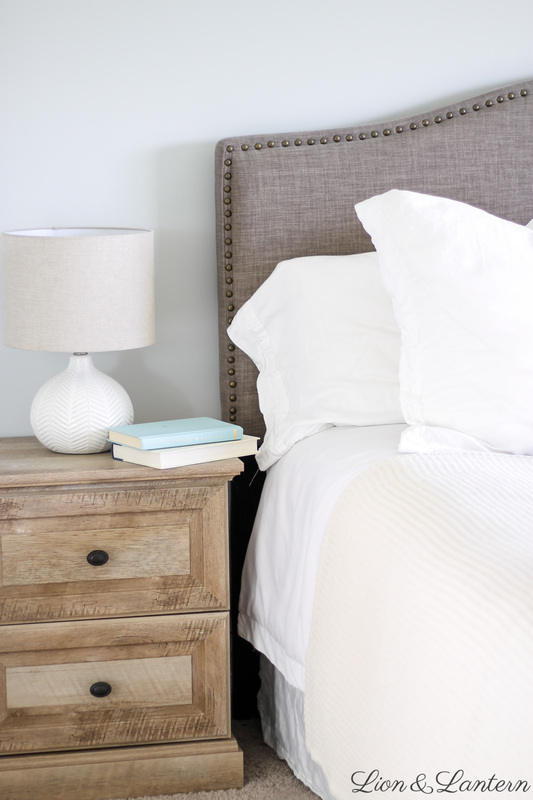 Our previous dresser was black and really weighed down the room; now it feels bright and fresh. Side note: our son and daughter each have the Hemnes 3-drawer chest in their room! You can see Ladybug’s nursery here. Search for pleasing titles. 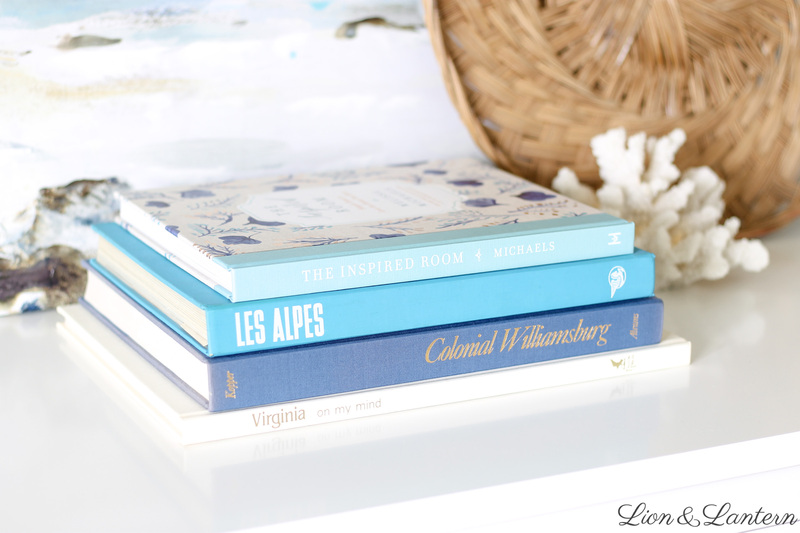 I found several smaller books with “Island” in the title–perfect for a coastal space! I also love books about destinations, as shown here. The Colonial Williamsburg book was a special find since my family visited there often during my childhood. Look underneath the dust cover. 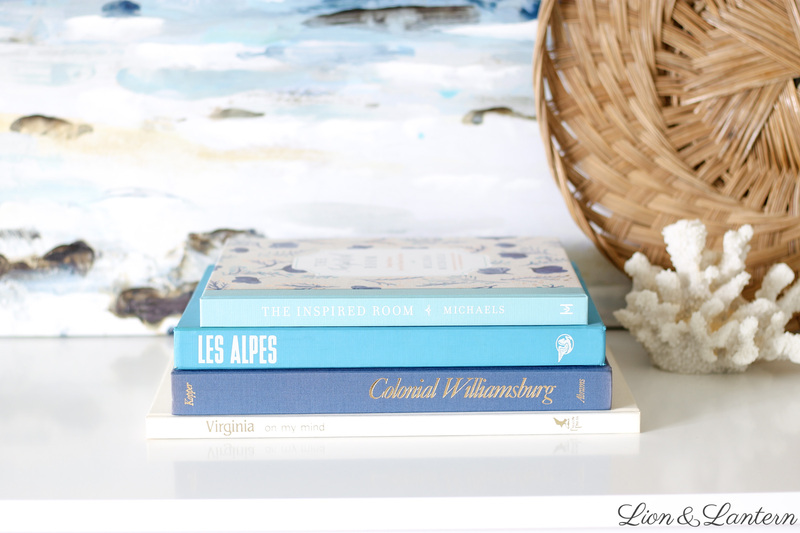 I usually look for white, cream, gray, or blue books, but this will depend on your decor style. Check back often. Thrift stores have a lot of turnover. I do not always find what I am looking for, but this was a good visit! Someday, I would love to have wall molding installed behind the bed as an accent wall. 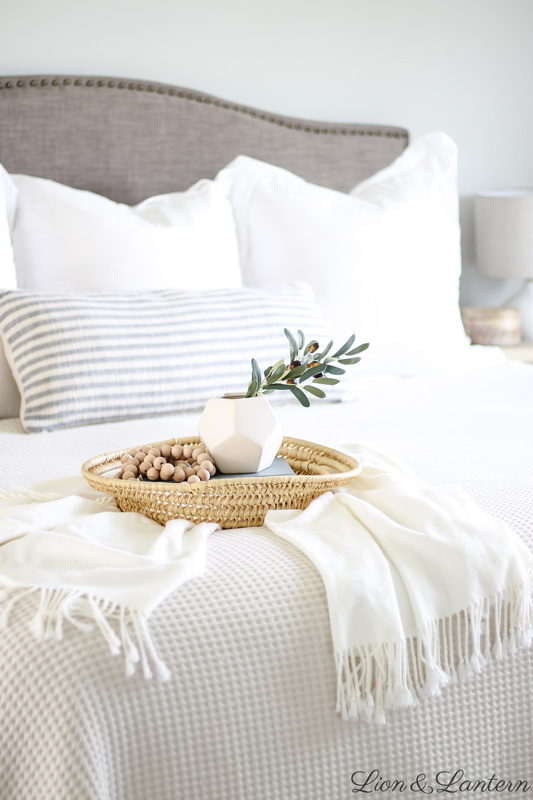 Currently, I’m on the hunt for an inexpensive faux tree for the basket beside the dresser, and have some other decor items on my wishlist (such as a rug for under the bed). 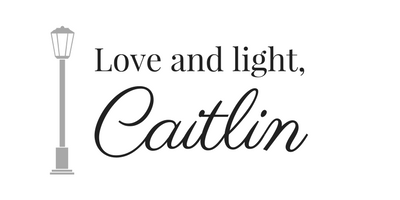 However, I can truly say that I am enjoying the gradual process of designing and decorating our home. The challenge of doing it on a budget, and using items that we already have, brings me such satisfaction. Finding that perfect piece at a thrift store for a fraction of the price is a great feeling. 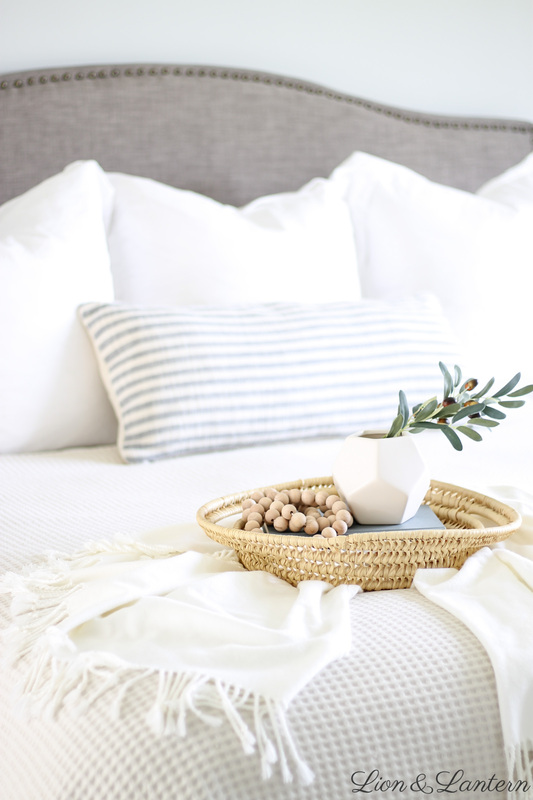 Of course, I love perusing the picture perfect homes of Pinterest and Instagram, but this is where we are right now, and cultivating our home is one of my biggest joys. Thanks so much for stopping by today dear friends. 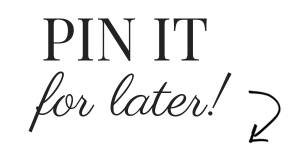 I would love to hear your favorite items to thrift, or see your current projects, so please leave me a comment below and say hello!